Hirsch's performances do not strike me as performative—exaggerated, in order to make clear the nature of the stereotypes or power relations that they depict. Rather, Hirsch uses performance as a research tool for investigating states of desire, loneliness, excitement, and obsessionin which television and the internet let us spend so much of our time. Suddenly, I realize that I have been clicking through Hirsch videos for over two hours. I wonder: is the maze into which I just stumbled the most effective kind of public art for an era after publics—when the idea of not only the public sphere but of any public sphere sounds quaint? While multiplying the kinds of encounters and exchanges that strangers can have, the internet has also freed imagined communities from the geographic bases to which print or broadcast media bound them. The web that weaves outward from therealannhirsch.com feels like an installation in a virtual town square. At the same time, of course, the very notion of a "counterpublic" (such as the community I imagine converging around Hirsch's website) relies on an idea of the private that the internet has transformed. Hirsch's work specifically highlights how the collapse of the distinction between public and private—historically gendered as male and female—affects women. Perhaps it is because the idea of the public no longer holds much sway that confessional, even self-consciously trivial, modes of self-expression have proven so successful online. Phenomena like Caroline/Scandalishious seem to prove that we are good at the internet. And yet no woman writer—no woman anything—needs to be reminded that the half-light of micro-fame is perilous. By the time I head to the New Museum to attend a rehearsal of the new work that the institution has commissioned from Hirsch, a few days after receiving that first email, I am regretting having agreed to write this piece. Playground has been billed as a "cybersex adventure" based on a relationship that Hirsch developed with an older man whom she met in a chatroom when she was twelve. But the prudish quiver of nerves that I feel has less to do with my Catholic upbringing than with my training as an academic. What do I know about performance art? To my relief, the rehearsal that I see is different from what I expected. It turns out to be a play, and not an extraordinarily explicit one, either. The setup is simple. It consists of two desks angled together, at which the two actors sit at keyboards: "Anni," a girl who appears to be in her mid-teens, and "Jobe," a man who looks around thirty. Behind them, there is a screen onto which a computer desktop is projected. It shows an old-fashioned AOL chat window in which we read what the two characters are typing to each other. In a departure from her prior work, the real Ann Hirsch does not appear. Anni and Jobe begin with abbreviated banalities, then move into more intimate confessions and questions. As the actors begin to speak out loud and even follow and touch each other, the mood the piece puts me in is curiously mixed. An undertow of illicit possibility pulls me through long spells of aimlessness. Jokes and moments of tenderness regularly break up stretches of what verges on boredom. Hirsch's present boyfriend, who is also in the audience at the rehearsal, tells me that she has been re-watching Yvonne Rainer's <em">Film About a Woman Who (1974) while writing Playground. In that film, Rainer projects lines of texts over, and inserts them between, the images of her main characters, ironically highlighting the gaps between what they think and what they say. Formally, it is easy to recognize what Hirsch has learned. But the scrolling text in Playground serves less to emphasize the split between self and surroundings than to create an intensely shared hallucination—the ground that holds the girl and man and both of them and their audience together. The projection reminds us that the love story that we are watching is, ultimately, a ghost story. Each character here is only a fantasy of the other, as Hirsch has conjured them from memory, for us. Is desire always like this? Is creativity? The piece gives a 1990s spin to a theme that is at least as old as the myths of Narcissus and Pygmalion: that love, like art, involves projection, that images we invent of others are both something human beings need and a risk we run. In Playground, personal nostalgia for girlhood desire dovetails with nostalgia for a medium, which also inspired dreams of sharing consciousness: the internet in its early years. As the characters become closer, they start to talk about "cybering," that is, having “cybersex.” The term, like "cyberspace," fell out of use as the parallel universe that it evoked became integrated into everyday life—put in service of government, business, and surveillance. Like all sites of sentimental and sexual education, cyberspace held out promises of both discovery and danger. I am too young to remember much. And I am not interested, or not now, in talking about the corporate colonization of that utopian nowhere that turned it into the contemporary internet threading through my iPad and iPhone. 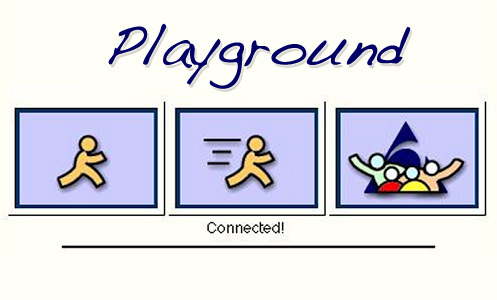 But suffice to say that in Playground, the era when one could disappear into the virtuality of chatrooms stands, in relation to the present, roughly as childhood stands to adulthood in the sentimental novel. That is, it evokes a cherished time before imperatives to grow up and become practical and profitable took hold. In their book on Remediation, Jay David Bolter and Richard Grusin famously argued that digital media incorporate and refashion forms that preceded them. But it has also proven true that, as new media eat old media, their more reflective practitioners have gone to even older institutions and used those as a means to reframe things and reflect. As a student of cinema, I think of how, in the 1990s, as celluloid film lost out to digital and even diehard cinéphiles started watching "films" online, moving images migrated en masse into galleries and museums. Playground uses perhaps the oldest medium, theater, to ask us what the old new media meant. Perhaps it is the sense of inventing an origin myth that gives this cybersex adventure its startling sweetness. Ann Hirsch's installation The Scandalishious Project: Caca Phony is on view at Abrons Art Center as part of the exhibition Hymns for Mr. Suzuki curated by Karen Archey.